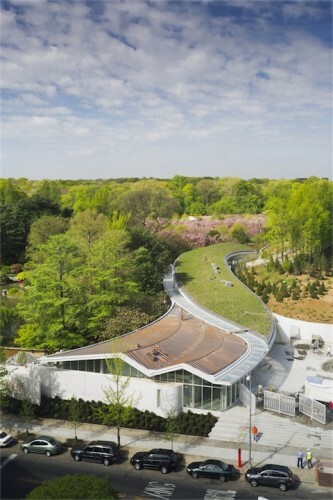 Accompanied by Mayor Bloomberg yesterday in an early morning ribbon cutting, New York City-based practice Weiss/Manfredi celebrated the grand opening of the new BrooklynBotanic Garden Visitor Center. 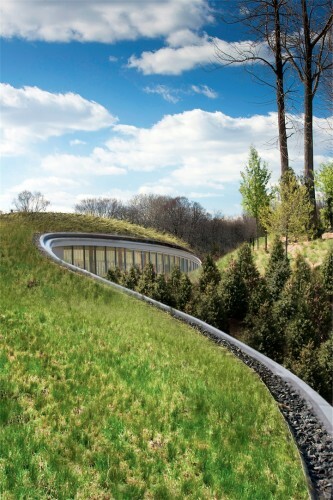 Embedded into an existing hillside at the Garden’s northeast corner, the sinuous glass building appears as a seamless extension to the existing topography as it leads into the 52-acre garden. In addition, the $28-million Visitor Center incorporates numerous environmentally sustainable features—most notably a 10,000-square-foot living roof—that are aimed toward earning LEED Gold certification. 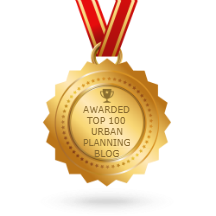 The project has been recognized by the New York City Public Design Commission with an Award for Excellence in Design. Continue reading after the break for the architects’ description. 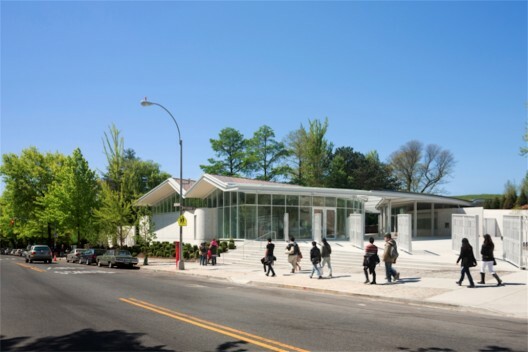 The 20,000-square-foot Visitor Center was conceived as a new threshold between the city and Brooklyn Botanic Garden (BBC) that transitions from an architectural presence at the street to a structured landscape within the Garden. 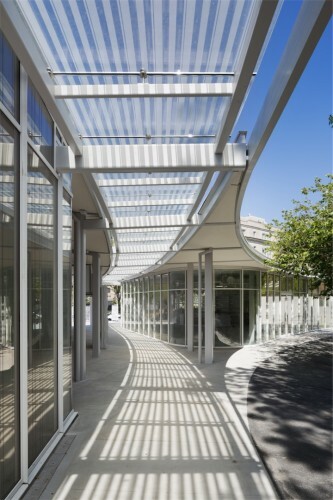 The Visitor Center invites visitors from Washington Avenue into the Garden via a curved glass trellis before opening into major garden precincts like the Japanese Hill-and-Pond Garden and Cherry Esplanade. 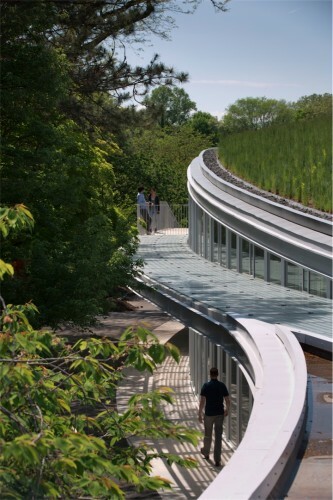 The primary entry from Washington Avenue is visible from the street; an additional entry from the elevated Overlook and Ginkgo Allée at the top of the berm bisects the Visitor Center, revealing framed views of the Japanese Hill-and-Pond Garden, and descends through a stepped ramp to the main level of the Garden. The curved glass walls of the Visitor Center offer veiled views into the Garden, their fritted glass filtering light and deterring bird strikes. In contrast to the southern face of the building, the north side is built into a preexisting berm, which increases thermal efficiency. 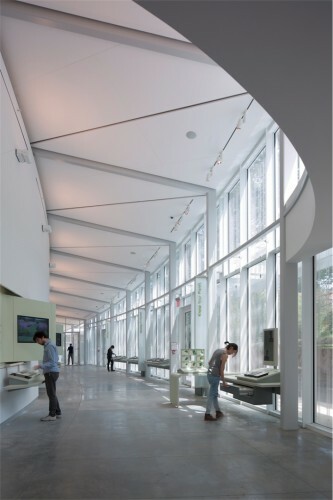 Its clerestory glazing—along with the fritted glass on the south walls— minimizes heat gain and maximizes natural illumination. A geoexchange system heats and cools the interior spaces, and a series of rain gardens collect and filter runoff to improve storm-water management. The leaf-shaped living roof hosts over 40,000 plants—grasses, spring bulbs, and perennial wildflowers—adding a new experimental landscape to the Garden’s collection. The green roof will change throughout the year, literally transforming the nature of the architecture each season. The Washington Avenue side of the building features a pleated copper roof that echoes the Garden’s landmarked 1917 McKim, Mead & White Administration Building and will ultimately weather to green. Nearly 60,000 plants were installed around the Visitor Center, including cherry, magnolia, and tupelo trees; viburnums; native roses; and three rain gardens full of water-loving plants. In combination with the green roof, this ambitious installation seamlessly weaves the Visitor Center into the green tapestry of the Garden.